NF Innova | TRUE DIGITAL BANKING WEBINAR: How to differentiate your customer service offering. TRUE DIGITAL BANKING WEBINAR: How to differentiate your customer service offering. 03 Jun TRUE DIGITAL BANKING WEBINAR: How to differentiate your customer service offering. Join us for a live webinar to see how digital processes will lead to increased revenue, lower operational costs and provide completely new customer experience. 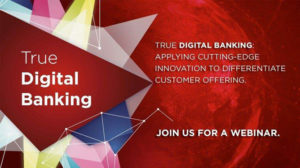 We will show you how end-to-end Digital Branch solution transforms existing business models and allows you to be a leader in Digital Banking transformation. The New Frontier Group case studies and examples from the leading regional Banks will be used to show business modelling, decision-making and intervallic results achieved after implementation. New Frontier Group is a leader in digital transformation especially in the banking industry, enabling real end-to-end digital process and providing an extended set of digital banking applications. Our new Digital Core solution is accommodating Fintech innovation thus allowing for a number of independent 3rd party solution providers to integrate within the existing core systems of any technology complainant business entity. We will explain and discuss the real case scenarios and lessons learned from clients and solution provider perspective, for You to get powerful insight into the newest Digital Banking trends and have the opportunity to discuss your scenarios with us. Thursday, June 9th, from 2:00 PM to 2:45 PM (CET).